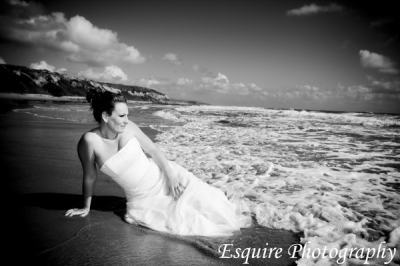 Cara’s Trash The Dress Shoot Testimonial! Good Afternoon! As I’m in post production this afternoon I received a wonderful email from Cara and her husband Eric for their Trash The Dress Shoot yesterday in Laguna Beach. Check it out, it’s wonderful! “David, There is no one word that would express the experience we had yesterday with you and Kerry. Eric and I couldn’t have asked for more professional, enthusiastic, visionary, fun, and perfect photographers. Our Trash the Dress session is something that we will remember forever. I hope you had as much of a memorable experience taking the pictures as we did creating them! Thank you for doing such a wonderful job! We are ecstatic to see what all of our pictures look like because the few that you showed us were absolutely amazing!!! Thank you for your patience and dedication to the photo shoot! Thatk you! We’ll talk to you soon. Have fun in England. If you’re digging Cara’s Trash The Dress Shoot and you’re thinking… Hey – I’d really like to get to know this Huntington Beach Wedding Photographer that loves 80′s music, fashion and would like to do a Trash The Dress Shoot yourself – feel free to contact me anytime. What a fantastic way to wrap up a great weekend – cheers!